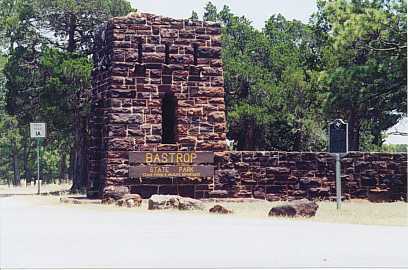 (The following information is used with permission from the Bastrop Advertiser and appeared in the Bastrop Advertiser's "Bastropian 2000-01") Bastrop State Park is located northeast of Bastrop on Texas 21 and is open year round for hiking, picnicking, swimming and golfing. 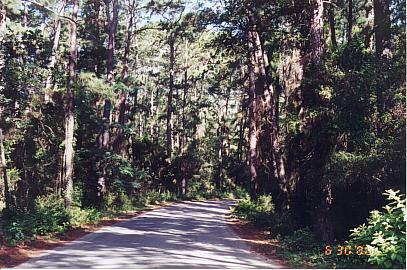 Nestled in the Lost Pines, Bastrop State Park encompasses 3,500 acres of loblolly pine, cedar and oak trees. 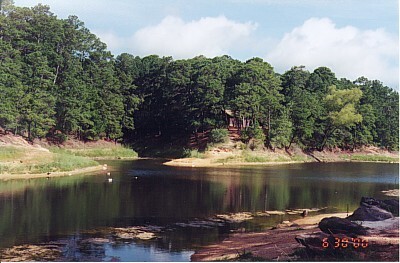 Built during the 1930's, mostly with labor from Civilian Conservation Corps, designs developed for Bastrop State Park set the basic style for all other Texas state parks. The original buildings and related features are now recognized historic landmarks. 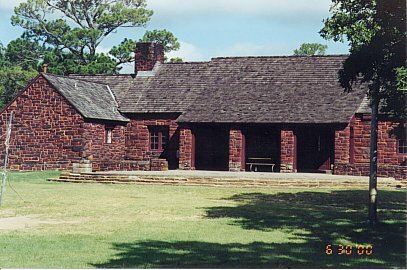 The park is one of 31 in Texas that were constructed by the CCC and one of only five recognized as a National Historic Landmark. A 10-acre lake stocked with perch, trout, bass and catfish offers anglers a chance to test their skills A state fishing license and entrance fee are required. The golf course recently expanded from nine to 18 holes. For more information about the the golf course, contact the state park. Swimming is not permitted at the park lake, but a 365,000 gallon swimming pool is available for a refreshing dip during the warmer months. Check with the park for the exact opening and closing dates. Pool hours are from noon to 6:45 p.m. The pool is closed on Tuesdays. There are picnic tables nearby and a snack bar inside the pool facility. And the kids can have some fun on a new playground built this year. Perhaps the most popular facilities in the park are the cabins. There are 12 cabins, which can accommodate a varying number of guests. Cabin rental fees vary depending upon occupancy. The cabins each have a kitchen with a stovetop, refrigerator and microwave oven, but do not provide kitchen utensils. Beds are provided with sheets and pillows. Towels are provided for the showers. No pets are permitted in the cabins or cabin area. The cabins have a fireplace, heat and air conditioning. Reservations can be made up to 11 months in advance by calling the state's central reservation center at (512) 389- 8900. Daily entrance fee to the park for ages 13 and older is $3. Other facilities are tent and RV camping areas and an 8.5-mile hiking trail with primitive camping permitted without fires. In the tent and RV camping areas, fees again will vary on the date selected and the type of site selected. 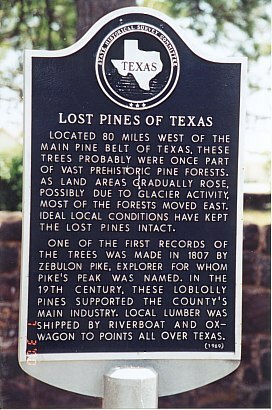 The Lost Pines Lodge accommodates eight people in air-conditioned and heated comfort. The lodge has a stove, refrigerator, oven and bath facilities. As with all other park facilities, there are no kitchen utensils available. For larger groups, the group camp, which can accommodate a total of 90 people, is available. This facility includes four dorms with bunk beds. There are no linens provided for this facility. A heated, combination dining-recreation hall with a 90-person capacity is furnished with tables, chairs, refrigerator, stove and outside barbecue pit. The commercialized kitchen has stoves and a large refrigerator but no kitchen utensils. A restroom with shower is located nearby. All the buildings are heated. An air-conditioned dining hall may be rented for day use. For more information, call the Bastrop State Park at (512) 321-2101 or park information toll-free at 1-800-792-1112. For reservations, call (512) 389-8900. Further information is available from Texas Parks and Wildlife.